Candles, Candle Holders, Glass Candle Holders, Painted Candle Holders, Upcycled Candle Holders, Repurposed Candle Holders, DIY Candle Holders, and . . . I like candle holders of all kinds, sizes, and colors. I enjoy buying them new, but mostly I enjoy thrifting for them and making them myself too. When I make changes with my home decor the candle holders will sometimes get a make over too. Although I have some wooden candle holders that were made from others, painted, came from old table legs, pillars, and etc that I will not get rid of. They just find different areas in the home to adorn. So, since I like diy candle holders I thought I would share something I had found. This is also on my list to play with, and see what I can create myself as well. What you are viewing is with some family pictures, but you know you could use other pictures as well. Maybe you got a pretty picture of some backyard scenery, mountains, sunsets, and you know. . . things like that. Well, those could also be used too. Just use whatever images you would truly like to use with this project. You will enjoy this as it is much easier than you think too! Sometimes you might have a special place in the home where you use only that special china, and where special memories are shared. Along with this sharing of things sometimes candles are lit for these areas. They are also used for special meals as well. 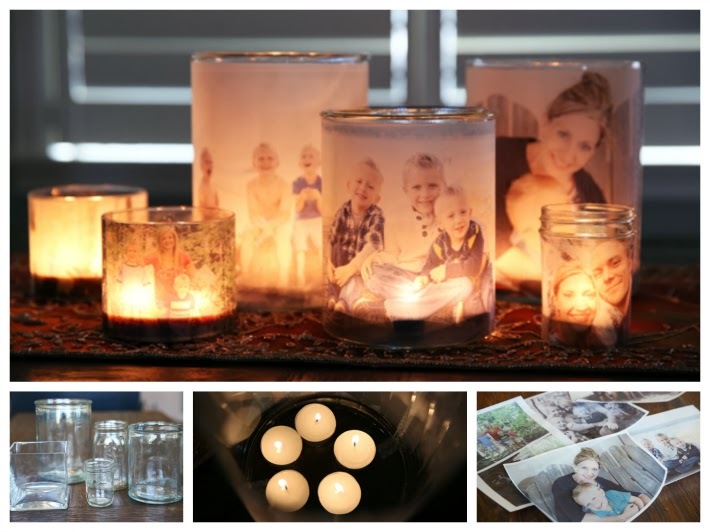 How neat to add in these glowing photo luminaries, don't you think? No matter how traditions have changed over time I still find it really neat to have those flickering lights on the tables during gatherings, when home by myself, and for the just because times too. So, find some of your favorite pictures you would like to use for this project. Then you will also need some vellum paper. I have some of that on hand myself, and some of it is colored vellum too. I lack stacking when I find sales with scrapbook stores. Never know when those things can be used, and now is a good time. You might have to experiment with your printers to make sure it will print onto vellum paper. Most inkjet printers should work for this. Now, print out a variety of photos you would like to use. Funny times, serious times, and some of those memories you so enjoy. Horizontal pictures will work best since you need the width to wrap with. Next make sure you have some glass jars, or vases that you would like to use for your candle holders. Try to avoid irregular shapes as that can get complicated to work with. Trim the photos to the proper height of the glass you are placing them with. Then, just apply a piece of double sided tape (easy peasy!) Just attach the photo to the tape. For larger containers you will use more than one photo. Apply some washi tape for decoration if you wish too. These little luminaries look great in the daylight, sitting on window sills, with table arrangements, and when the light pours through them it will make them naturally glow! How neat, right? So, start thinking about your own family memories that you could light up with. Then, follow over to ourbestbites.com for pictures, and full instructions of how to do this fun project. Hope you all brought in the New Year well, had fun, enjoyed, and were safe too. Time is flying already, isn't it? Our first weekend of the New Year is now past us, and here is our first Monday! Thanks so much for sharing time at LilacsNDreams, and hope to see you again soon. Toodles . . . .